Miss Marieta I. Higginbotham, 19, of 3507 15th St. A, Moline, died at 8 last night [Thursday, 26 March 1964] in University Hoospitals, Iowa City. She had been in a diabetic coma for two days. Services will be at 1:30 tomorrow afternoon in the Esterdahl Chapel with the Rev. William S. Mellish, pastor of First Congregational Church, officiating. Burial will be in Riverside Cemetery. Pallbearers will be George Soethe, Jack Foley, Ronald Faust, William Millard, John Peterson and Charles Ydeen Jr.
Miss Higginbotham was the daughter of Clarence V. and Ethel G. Johnson Higginbotham and was born July 6, 1944, in Davenport. She was graduated from St. Katharine's School, Davenport, in 1962, and was a student at Augustana College. She moved with her family to Moline in 1950, and attended First Congregational Church. Surviving are her parents, with whom she resided; a sister, Vaughn Lea, Iowa City; an aunt, Miss Irene Johnson, Moline, and an uncle, Raymond Johnson, Urbana. I remember Rita and I roller skating in my basement for hours on end......so many years ago....it must have been winter. 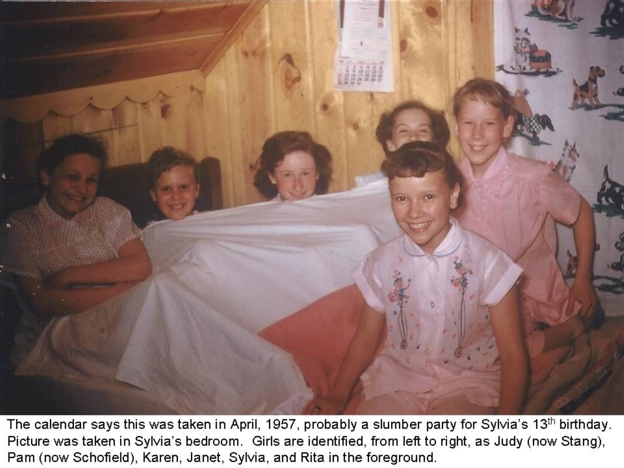 Picture of Rita with friends at a 7th grade slumber party. I remember Rikta well. She faced enormous healtrh challenges her whole life. She wasa very sweet and kind individual. Thank you, Rick, for posting this. I remember Rita as a very nice sweet and friendly girl.She was so young when she died.If my memory serves me right (that could be iffy) her father was a riverboat captain.She spent alot of time going up and down the river with him during the summers.She was a wonderful human being.Thank you Rick for posting this picture. You are correct, Marcia, about her dad being a river boat captain. One summer (I think the summer after 8th grade), I had the privilege of going with Rita on her dad's boat from Cairo, Illinois, to New Orleans. The boat was like a 5 star hotel, beautiful staterooms, fancy chef, etc. I don't remember how long the trip was, but it was quite an adventure. We spent a few days in New Orleans, then Rita, her mom and I flew home. It was certainly a trip of a lifetime for me. As others have said, Rita was a very sweet girl. I remember when the excursion boat Avalon would dock at Rock Island to take on passengers. Rita's dad would take over the wheel and pilot the boat when it was in the Quad City area. Jane Pease: Did you see your picture above at my slumber party?